The players change but John Groce's ILL teams all look the same. Meh. Aaron Moesch in the game for the #Badgers . #Badgers lead 31-17 with 2:49 until halftime. Koenig with 9 points to lead all scorers. Heard from ILL student section: This is our new offense. It is called motion -- where we don't move. ???? Aaron Moesch checks into the game for the #Badgers . Bronson Koenig now has a game-high 9 points (4-5 FG). Aaron Moesch with back-to-back offensive rebounds for Wisconsin. Gard getting some nice contributions from his bench. UW might end up having the ball for the final 1:38 of the half after grabbing 3 offensive boards to keep alive the possession. Not sure if you noticed but #Badgers Thomas, out of nowhere, appears comfortable on the court. Good news for UW. #Badgers take a 33-20 halftime lead on a late tip by Vitto Brown off miss by Koenig. 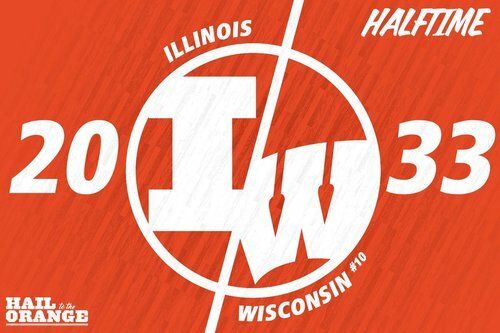 Halftime: #Badgers 33, Illinois 20. Brown grabs the 4th offensive rebound of the possession and puts back Koenig's miss to end half. #Badgers final possession of the half... 4 offensive rebounds ending with a Vitto Brown putback bucket. #Badgers have not trailed tonight and have led for 18:54. Wisconsin with nine offensive rebounds in the first half (four by Vitto Brown) leading to seven second-chance points. The #Badgers outrebounded Illinois 22-14 in the first half. Happ with 7 boards, Brown with 4. #Badgers Brown with 5 points and 4 rebounds in the half. Very active. Brace is off. Likely not a coincidence. First Half Scoring: Koenig 9, Happ 6, Brown 5, Hayes 3, Iverson 3, Showalter 3, Thomas 2, Trice 2. PPP: #Badgers 1.14, Illinois 0.71. Illinois shot 32.0 percent overall, 26.7 percent on 2-point shots. Wisconsin with nine offensive rebounds in the first half (Happ and Moesch each w/ 3). UW w/ 7 second-chance points. #Badgers had five offensive boards on last possession (final 1:08). Moesch (3), Happ and Brown for the basket. Unreal. 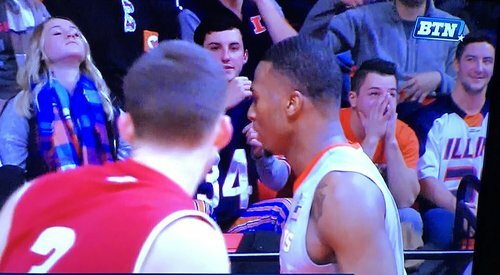 A wild Nigel Hayes appears! Illinois keeping things interesting. #Badgers up 37-26 with 15:03 to go. Hayes' putback dunk ended run of 5 empties. 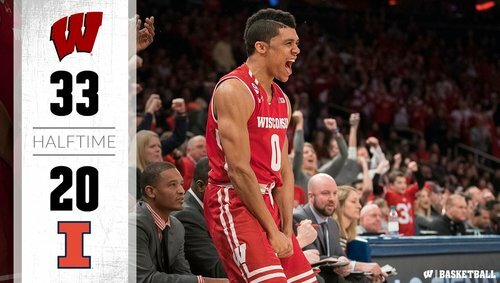 Hayes ends #Badgers ' drought (18:43--15:31) with a dunk off Koenig miss. UW lead is 37-26 with 15:03 left. Wisconsin leads 37-26 with 15:02 left. Badgers 2 of 7 to start the second half and have committed three turnovers. #Illini have stepped it up defensively this half (WIS 2-7 FG, 3 TO). SFC crowd back into it. Let's GOOO! #Badgers have yet to attempt a FT tonight. Nigel Hayes with an emphatic putback jam in traffic for the #Badgers . Koenig has 9pts and Happ has 8pts. Enough of this Illinois run. Give him 2 triples. He's got 6pts.